It has not been an easy year for Theresa May and her colleagues, what with Brexit and various other political challenges. With that in mind, and the suspicion that food for thought – based on fantastic British Red Tractor pork – might be in order, the NPA has sent cook books to the Prime Minister, Defra Secretary Michael Gove, Brexit Secretary David Davis, Trade Secretary Liam Fox and other key political figures. The early Christmas presents are full of delicious recipes put together by Ladies in Pigs (LIPs), along with information explaining why British pork should be at heart of all festive feasts. A letter to Mrs May from NPA chairman Richard Lister accompanying the gifts thanked the Prime Minister for her Government’s ongoing engagement this year with the NPA. It added: “Like many other agricultural sectors, we have a unique set of challenges facing us as a result of Brexit; however I am sure you will agree that the UK’s pig sector stands well positioned to make the most of the many opportunities offered by the UK leaving the European Union. “From rationalising better targeted UK based legislation, to helping pig producers improve the productivity, innovation, health and welfare of their animals to opening up new export markets around the world, we at the NPA believe that 2018 can be a very promising year for our industry. “The NPA and its members look forward to continue working closely with you, your Ministers, and your MPs to ensure these aspirations are met, and that our industry can thrive. Defra Ministers George Eustice, Therese Coffey and Lord Gardiner. Shadow Defra Minister Sue Hayman and Shadow Trade Minister Barry Gardiner. Tim Farron, former Lib Dem leader and now the party’s agriculture spokesman. Neil Parish, chair of the EFRA committee, Jim Shannon, chair of the All-Party Parliamentary Group (APPG) on pig and poultry, and David Simpson, who sits on both bodies. Supportive MPs from major pig areas Jo Churchill (Bury St Edmunds), Sir Greg Knight (East Yorkshire), Peter Aldous (Waveney, Suffolk) , Kevin Hollinrake (Richard Lister’s MP in Yorkshire and PPS to Michael Gove, Vicky Ford (former MEP, now MP for Chelmsford) and Richard Bacon (of course) (Norfolk). Baroness Anne Mackintosh, a former ERFA Select Committee chair now in the House of Lords. 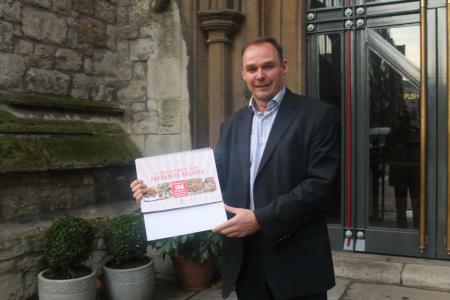 Richard (pictured with the cookery book) said: “It’s been a difficult year for Mrs May and many of her colleagues in Westminster, so we thought we would send a gift to help them relax and recharge. “Our message is to enjoy the festive period with the help of some truly great British Red Tractor pork dishes – and then hopefully cook up something the British pig industry can benefit from as the Brexit negotiations unfold in 2018.